Director Ryan Coogler enters new territory with “Black Panther,” peeling back old layers of the formulaic superhero narrative to reveal fresh and exciting elements rarely seen in the genre. Following the enormous box office success of Marvel’s latest entries — “Guardians of the Galaxy Vol. 2” and “Thor: Ragnarok” — the company’s newest excursion, “Black Panther,” was gearing up to be another retread of flashy spectacle and overbearing comedy. However, as I walked out of “Black Panther,” I exhaled a long breath of relief. Released Feb. 16, “Black Panther” imbues a spiritual energy unlike other superhero films, fueled by the incredible visual design of a fictional nation and the projection of its technologically advanced culture, rooted in African heritage. 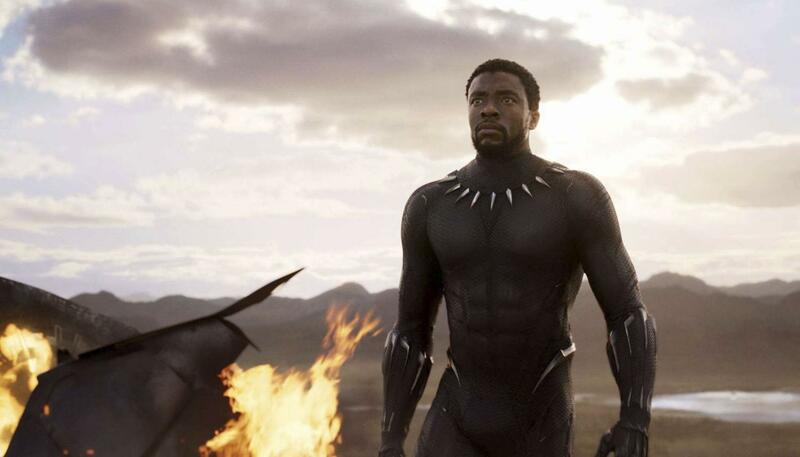 The film takes place in Wakanda — a utopian, technologically superior country located somewhere in Africa, but hidden from the world and disguised as a poor, developing nation. The source of its flourishing prosperity is vibranium — the strongest and most efficient metal on Earth — which acts as the centerpiece for all of Wakanda’s infrastructure and technology. T’Challa — otherwise known as the Black Panther, played by Chadwick Boseman — has inherited the throne from his late father, along with the responsibility of protecting the people of Wakanda and ensuring the country’s deposits of vibranium don’t fall into the wrong hands. At T’Challa’s side are his empathetic mother Ramonda, played by Angela Bassett, his loyal general Okoye, played by Danai Gurira, and his rebellious love interest Nakia, played by Lupita Nyong’o — who all shift the weight of his responsibility onto their shoulders as well. Not long after being crowned, T’Challa is usurped by Erik Killmonger — played by Michael B. Jordan — who believes Wakanda has been unfairly stockpiling vibranium for its own benefit, rather than sharing this technology with oppressed African populations. Dethroned by the physically imposing Killmonger, T’Challa struggles with adhering to the tradition and decree of his ancestors versus following his own judgement of what is right. He must channel the spirit of Black Panther to protect his homeland and the world from cataclysmic war. Despite this narrative structure, “Black Panther” evolves past the triviality of older films in the expanded Marvel universe and grounds the viewer with pertinent, controversial social commentary on racism, xenophobia and gender neutrality — underlying a plot more akin to a coming-of-age story. Many of the secondary antagonists of the film, such as Ulysses Klaue, played by Andy Serkis, act as the embodiment of racism, referring to Wakandans as savages and disrespecting their culture. This blatant racism is one of the motivations for the primary antagonist of the film, Killmonger — who represents the extreme, rage-induced side of the oppressed freedom fighters — to abandon reasonable judgement for full-on vengeance. T’Challa must act as the middleman between the two radical groups, sympathizing with Killmonger’s plight but also understanding that his approach is more vindictive than liberating. The depiction of women in “Black Panther” is vibrant — in the sense that all of the female leads steal the show with their unprecedented heroics and loyalty. Okoye and Nakia prove to be more than capable of holding their own in combat — saving T’Challa many times from his occasionally reckless actions. Danai Gurira displays tenacity with small bouts of wry humor in her performance as Okoye, the general of Wakanda — which stands in contrast to Lupita Nyong’o’s iron-jawed, rebellious portrayal of Nakia. T’Challa’s genius younger sister Shuri, played by Letitia Wright, captivates with her charm and technological wit, but shines brightest when protecting her older brother from Killmonger. In the face of death, she stands tall and firm, willing to die to protect her brother, her country and her culture. The sacrifices these women make make for the foundations of T’Challa’s victory over Killmonger and serve as definitive examples of heroism in the film. Given the growing division in race, politics and culture in today’s society, it is enjoyable to see a film embrace cultural diversity and dispel xenophobic attitudes through subtle internal character conflict. The film’s sole downfall may be it’s technical aspects — the CGI in the action sequences was surprisingly disappointing. The movements of T’Challa and Killmonger feel unnaturally stiff during fighting scenes, and as a result, there are way too many cuts in the middle of the action to hide this underdevelopment in CGI. The cuts have a disorienting effect on the action and, given that most battle sequences are shot in the dark as a part of Black Panther’s stealth tactic, they can be hard to follow. This is unexpected, considering that Coogler recently directed “Creed” — lauded for its realistic fight choreography and framing with heightened grandeur. Aside from some lapses in CGI, “Black Panther” is a triumphant film, fitting together action, drama, romance, comedy and adventure into a coherent story of heroism and pride in the wake of growing conformist attitudes — all the while redefining the superhero movie genre.